The "Six Week Body Makeover" diet by Michael Thurmond claims that eating for your body type will help you keep your energy level higher, raise your metabolism and provide you with better overall health. This diet gives custom eating and workout plans to your specific body type. Endomorph body types, which this diet calls body type A, have a high fat-to-muscle ratio, tend to be softer and gain weight easily, according to BodyBuilding.com. The "Six Week Body Makeover" claims that endomorphs should avoid red meats and eat egg whites, lean chicken and turkey and fish to lose weight rapidly. This program claims that eating red meat will slow your metabolism down since it takes longer to metabolize than other proteins. 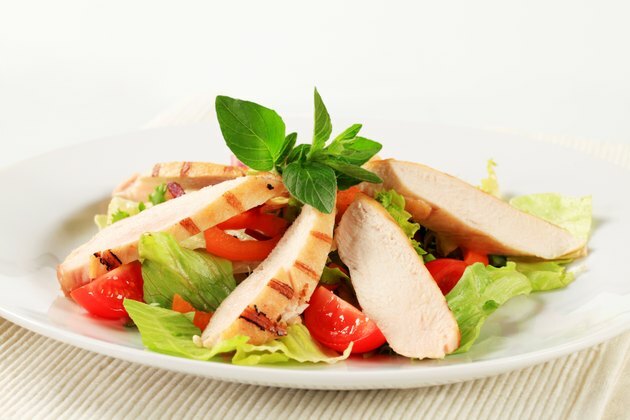 Lean chicken, turkey and fish metabolize quickly and help accelerate your metabolism for weight loss. On this diet you will avoid simple carbohydrates such as sweet fruits, pure sugars and processed grains that can spike your blood sugar level and slow down your metabolism. This diet suggests you eat squash, sweet potatoes, brown rice, jicama, parsnips, rutabagas and whole grains with the proper amount of protein to keep your insulin level stable and your energy level high for fast weight loss. The diet suggests type A bodies eat every two to three hours to keep your metabolism high. This often includes fresh fruit and vegetables for snacks. On this diet you can eat grapefruit, berries, peaches, pineapple, asparagus, bell pepper, bok cabbage, broccoli, Brussels Sprouts, carrots, cauliflower, celery, cucumbers, eggplant, green beans, mustard, collard and turnip greens, lettuce, mushrooms, snow peas, spinach and sprouts.